Japanese mockorange shrubs can be found in subtropical locations. This plant is a tough shrub that can handle many different conditions found in urban areas. 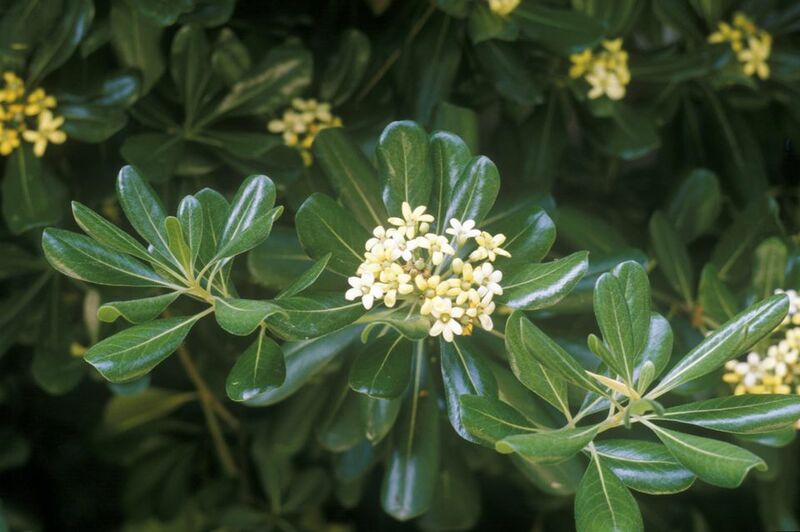 This plant is classified as Pittosporum tobira. It belongs to the Pittosporaceae family. Some common names for this shrub include Japanese mockorange, Japanese cheesewood, Japanese pittosporum, tobira, and Japanese mock-orange. This can be a part of your landscape if you live in Zones 8 through 10. As the common name suggests, this shrub is native to Japan, but also found in China and Korea. Most Pittosporum tobira shrubs will reach a height between 6' to 15' tall and spread a similar distance, depending on the variety. It forms into a round shrub or small tree. You can plant this shrub in almost any location as it can grow in full sun to full shade. The green leaves are obovate and spoon-like in that the edges curve down. Each is 2" to 4" long. We see a variegated variety most often which has creamy margins. A capsule forms after the flowers are pollinated. They open to show off three seeds surrounded by sticky pulp. This can grow well if placed in a seaside garden as it can tolerate salt. If you like the look but need a dwarf size, look for 'Wheeler's Dwarf' and 'Cream de Mint'. Each will get 2' to 3' tall. You can grow more of these shrubs by planting the seeds or taking cuttings. Japanese mockorange can handle most soil pHs, salt, clay, and heat. The best growth will happen if your soil drains well. This shrub can really take off in its early years, so you might have to be diligent in your pruning to keep it in check. As it matures, growth does become more manageable. If you are pruning away branches, do it after the flowers appear lest you lose the floral display. You can also prune it to have a central leader and become a small tree.